Discover Jasper Johns’s beeswax and found-object collages with over 120 of the artist’s most iconic and significant paintings, sculptures, prints and drawings. 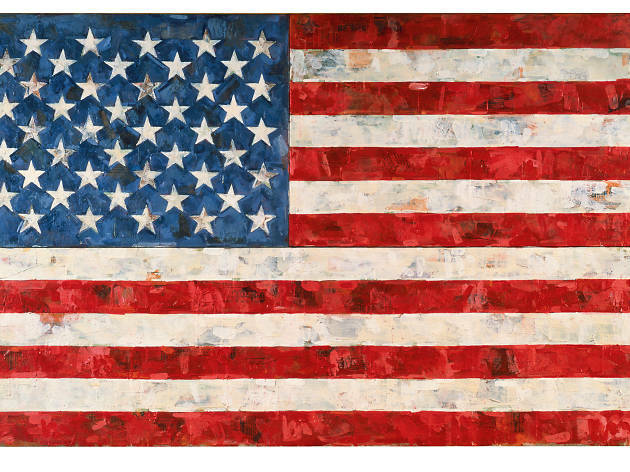 Flags, numbers, targets, maps: Iconic American painter Jasper Johns has made a career out of reworking instantly recognizable symbols into colorful works that forgo pontifications in favor of view-constructed meaning. The same can be said of the Broad’s substantial retrospective, “Jasper Johns: ‘Something Resembling Truth,’” which separates the artist’s ongoing six-decade career into its familiar motifs. 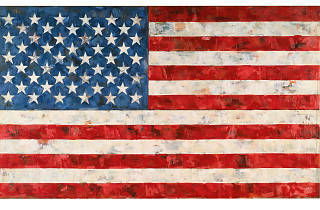 Even the most infrequent museum visitors have likely encountered one of Johns’s instantly recognizable flag, number or target paintings in a gallery setting. But few have encountered the sheer number (and quality) of Johns’s works on display at this exhibition. In addition to paintings pulled directly from the Broad’s collection, “Something Resembling Truth” borrows works from the country’s finest modern and contemporary art museums, perhaps most notably the Whitney’s “Three Flags.” The result is a truly impressive assortment that lets, as Johns intends it, the artwork speak for itself, with light commentary that explores aspects like the artist’s use of studio objects in his paintings or the personal and aesthetic affects of his close relationship with contemporary Robert Rauschenberg.